HAVE YOU EVER felt like you're caught in a river of circumstance? You've tried to get out of the boat, but the current is swift and the water is rough. It doesn't look like there's any escape. King David's life was like that. One thing that stands out about David is how he reacted to adversity. Regardless of what came against him, David always expected God to help him. Expectation is an attitude to embrace. We need it to get through adversity, but we also need it when we're standing in faith to receive something from God. David never doubted His love and faithfulness. How could he be so confident? God was the rock he stood on. To him God's Word was everything, and he highly esteemed it. Has someone ever assured you that he would help you? Because of your relationship, you knew you could trust his word. It never crossed your mind that he wouldn't help. We need to extend that same trust to God. Yet this is often not the case. It's strange that some people can trust people easier than they can Him. Why is it so hard to believe that God will do what He said? When people pray and nothing happens, they wonder why. While there could be many reasons, here are two prevalent ones. First, James, the brother of Jesus, tells us that our prayers need to be faith-filled (James 1:6). But how many times have we brought a request to the Lord and when nothing happened, we began to wonder? David said, "In the morning I lay my requests before you and WAIT expectantly" (Ps. 5:3 NIV). He didn't put a time limit on his prayers. He stayed in faith until he saw his answer. Second, people don't receive because they try to figure everything out instead of simply trusting God. They think, "How in the world is this going to work out?" The answer is—it doesn't matter. If God said it, you can expect it! You will never be able to figure out how He will do something. Although the time between praying and receiving can seem long, staying focused on the promises of God will help you not to become discouraged. Plunging into His promises will keep you focused on what He can do. When some people go swimming, they first put their toes in the water. They want to test it to see how cold it is. People do the same thing with God's promises. They poke around the edges. But if you really want to receive what He has for you, just jump in! What would you do if you knew that God was always ready to help you? Would you try to do more than you're doing right now? Would you try to do what you have always dreamed of doing? Would you dare to attempt what others say is impossible? Men and women attempt great things for God because they believe He will act on their behalf. When things aren't going well, their faith and hope are still in Him. What has God called you to do? Not everyone is called to full-time ministry. His plan for some is to work in secular business or in some other field. Wherever you are, you are called to make an impact. What are you expecting Him to do for you and through you? God is always ready to help. The Holy Spirit is waiting to move on your behalf when you trust Him. God's Spirit is His power moving in your life. EXPECTANT FAITH IS THE TRIGGER THAT CAUSES HIM TO MOVE. This is the hour to expect a great God to do great things. This is the time to step out and do great things with Him and for Him. He will meet you at your level of expectation and do what He has promised in His Word. [Editor's note: This article was adapted from Kenneth W. Hagin's new book, What Can You Do to Receive From God? EXPECT. 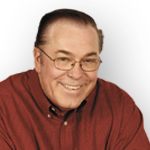 For more encouragement to stand when tested, go to khm.com/pressured and read Kenneth W. Hagin's article "How to Handle Pressure."